Yesterday I got to finally ride with Darren, Steven and their friend Ryan in Post Canyon near Hood River, OR on the flanks of Mt. Hood. 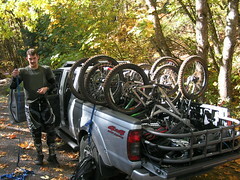 The area is a free-ride park of single track trails, huge kickers, bridges, gaps, see-saws, etc. 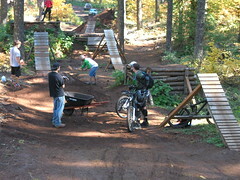 It's like a skiing terrain park but built for bikers in the thick woods. It was truly amazing to see what these guys can do on their bikes. 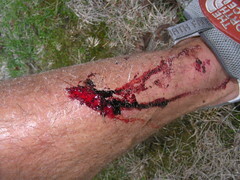 I was just happy I could pretty much keep up with them on the downhill single track through the woods. There was no way in hell I was going to attempt any of the jumps they were hitting. The wooden ramps they were taking off from were 8-10 feet high with gaps of nearly 25-30 feet so these guys were about 20+ feet in the air at times! These were jumps that I would consider decent for skiing and they were hitting them with metal between their legs and landing on solid ground! And Darren was even riding a bike with the same travel as mine and cleaning them just fine... I took a ton of video of Ryan and Darren eating up the jumps like they were nothing. I myself hit a small gap (not on purpose but I was going to fast to turn out of it) and I cleared it ok which gave me some confidence. Steven let me borrow an extra top of SixSixOne body armor which felt good but before I start pushing myself I want to get full body protection and a full face helmet as well. I'd like to get into the sport because it's still not as popular as the terrain parks at ski resorts where you now have to wait inline for the hits. At Post Canyon on a beautiful fall day with perfectly tacky dirt we could have ridden the entire trail down, hit all the jumps, and not passed anyone without stopping. That's amazing to me. So.. I now have another wild sport to look forward to getting into next summer with these guys. They said they would help me fix up my bike and I'm definitely going to take them up on that one weekend this winter when I'm up there to go skiing. Check out the slideshow of hits by clicking the title of this post. I'll be putting together a video of these guys shortly as well hopefully.